After the summer break and our practice during Ango in Shorinji we show the pictures of the last call for “Zen Moment”, our photo competition has already held its fifth edition. Here we put the winning photo in 2016 and which came second, authored enjoyed the award during the last month of August. As you know, this competition we develop every year on our Facebook profile “Barbara Kosen Sangha Zen” and are our friends of the Sangha, all you who decide the picture that you like. One that receives more “likes” is the winning photo. Winning photograph of “Zen instant 2016”, Julien Pettex-Muffat. In this V edition they submitted to the contest 41 photographs. We always ask that the photographs portray a moment, something magical and that is related to the practice of zazen and Zen philosophy. For those who want to be in the next edition of 2017, know that the most voted photos are those that have to do directly with the practice: ie significant moments of our practice in the dojo or in other natural areas and also photographs of objects we use everyday when we sit in zazen. The first year, 2012, the winning photograph recounted a magical moment, when the tea is served after eating the guenmai in the dojo. The winner was a fellow Dojo of Barcelona. The second year, in 2013, which won the most votes was a portrait of our teacher, Barbara Kosen, before the altar at the ceremony following zazen; photo taken by a fellow Sangha Mexico City. In the third call was a zafu flying, and caught in the air; photograph taken by a fellow Sangha of Budapest. In 2015 our prize was in Buenos Aires: a beautiful portrait of a bodhisattva doing zazen facing the sea. And in 2016 was a moment of organization within an English dojo which won the award, with a picture in chiaroscuro. Many winners have failed to enjoy the prize, stay at one of the sessions of summer camp, Ango , in Shorinji. This last year enjoyed the second prize winner, a fellow Gijon Dojo. 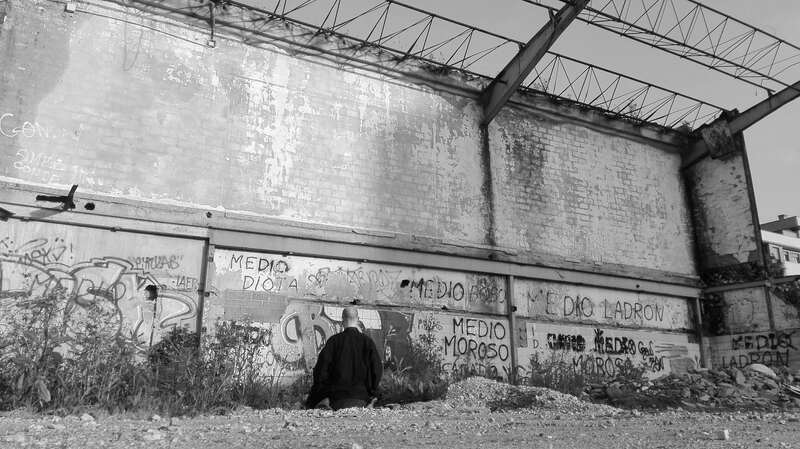 His photograph portrays a person practicing zazen in an abandoned space, in ruins, full of graffiti and dirt: zazen sublimates everything.